Our first Houston event was a huge success! 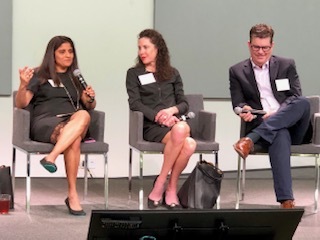 Payal Patal (Station Houston) moderated a great discussion with Gina Luna (Houston Exponential) and Tom Luby (TMC Innovation Institute). Houston is clearly making a real investment in its entrepreneurs and innovators. Thank you to our sponsor, Baker Botts — and special thanks to Natalie Gonzales, Michelle Eber, Sara Baltazar, and Caitlin Davis for helping the day run so smoothly. We are thrilled with the enthusiasm of the Houston Innovation community and cannot wait to continue the conversation.